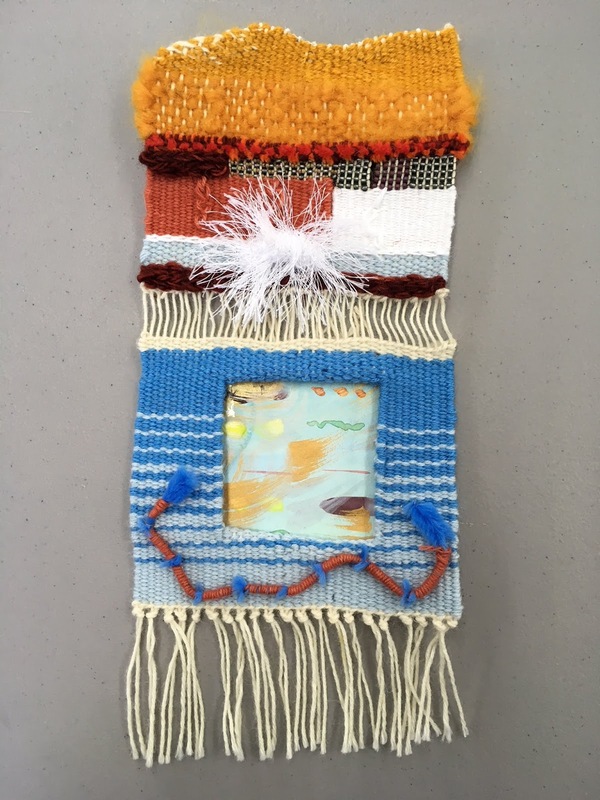 Last week I wrote about how a workshop with Rowen Schussheim Anderson "blew the lid off my traditional tapestry box." I was, and am, excited by the prospect of incorporating mixed media and techniques into the traditional flat, weft-faced tapestry surface. 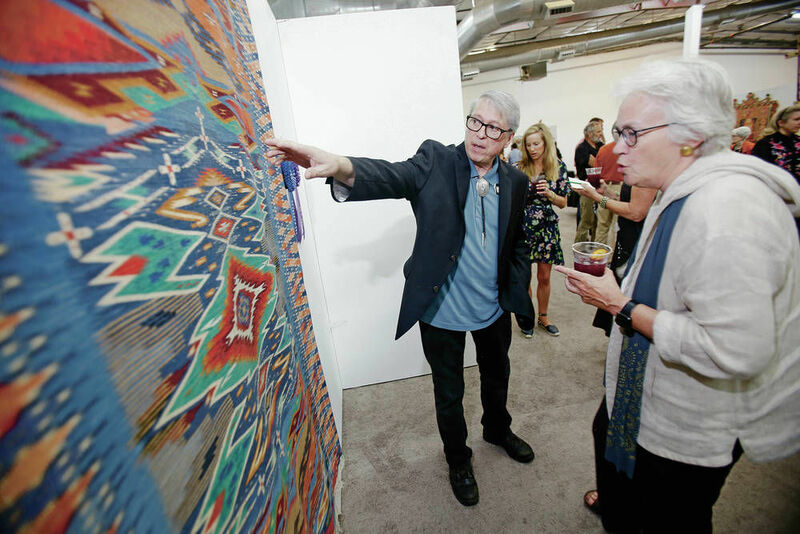 "Irvin Trujillo, in discussing his winning piece, explained that while most artists are told to think outside the box, his weaving explores the concept of the box by going back to traditional roots. 'The box hasn't been defined yet,' he said of his textile, which took eight months to create. 'So we have to figure out the box before going outside.'" Barbara Crowley of Maine at the preview for Spanish Market. Wow! Irvin comes from seven generations of Rio Grande weavers, and he feels the box hasn't been defined yet! I am going to ponder that thought for quite a while. Irvin's words, and even more, his stunning weaving, confirm that there is still plenty to be discovered and achieved inside the traditional box of weft-faced weaving, and within the various traditions within the tapestry field (Rio Grande, French, Navajo and others. . .). Treat yourself and hop over HERE to see some of Irvin's work. And of course the art of many other contemporary tapestry weavers who work within the parameters of pure tapestry also affirms this. 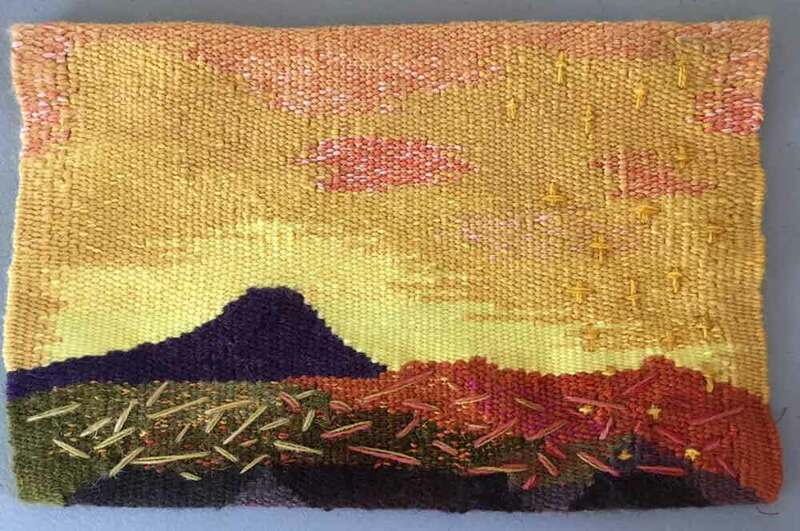 For proof of this, look no further than the member artists of the American Tapestry Alliance. Many of us have discovered that working within limits can be paradoxically freeing and actually lead us to find new solutions for creative problems. On the most basic level, if you've ever run out of a particular type or color of irreplaceable yarn before you've finished weaving, you know what I mean. You have to find new solutions within the parameters you're working in, and often those solutions make for a more interesting piece in the end. So, where does that leave me (and maybe you? ), a contemporary weaver, excited by the modern anything-goes approach yet impressed and informed by what is possible in the traditional manner? Darned if I know! I'm headed back to the studio to see if I can find out where my work lies in relation to the box. . . . Meanwhile, let me know in the comments--is your work inside the box? Outside? How does your conception of your relation to the box inform your work? I've recently been mulling over the familiar metaphor of working "inside (or outside) the box" with regards to tapestry. 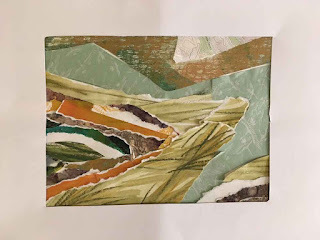 Last month I had the great pleasure of taking a week-long workshop with tapestry artist and art professor Rowen Schussheim-Anderson at the American Tapestry Alliance's retreat in Reno, Nevada. 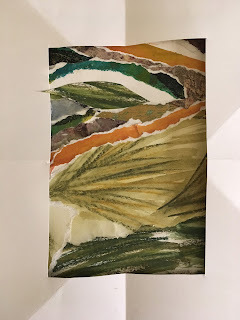 I was excited by the promise of learning to use mixed materials and techniques, including collage (already one of my favorite approaches to design) in tapestry. I am still excited and still exploring the possibilities. 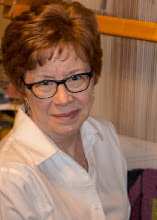 It was fun to be introduced to so many new-to-me techniques, including weaving a window in the surface of the tapestry, adding novelty yarns, adding on surface embellishments such as wrapped and coiled pipe cleaners and bits of clothesline, and twining, crochet and beadwork techniques as part of the woven surface. Rowen told us our workshop weaving would not be a coherent work of art, and she was right, at least in my case. It's a funky little thing, but it will be a good reminder to me of some of the things we tried. 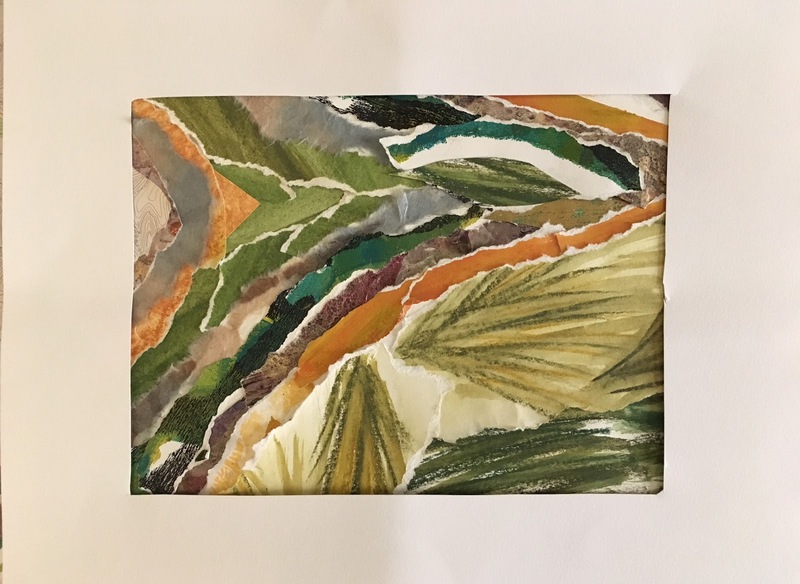 Molly Elkind, mixed media sample from Rowen Schussheim-Anderson workshop, 2018. That's my painted paper in the window. Speaking of funky little experiments, another thing we did was add large stitched marks to previous tapestries we may have done that we were not happy with. I really liked the energy and added texture that stitches added to this very early tapestry of mine. I'm definitely keeping this in mind for future work. We also did a number of sketchbook exercises including an approach to collage that I haven't tried before. For me this involved enlarging a section of a topo map and using it as a template for a cut and pasted paper design. 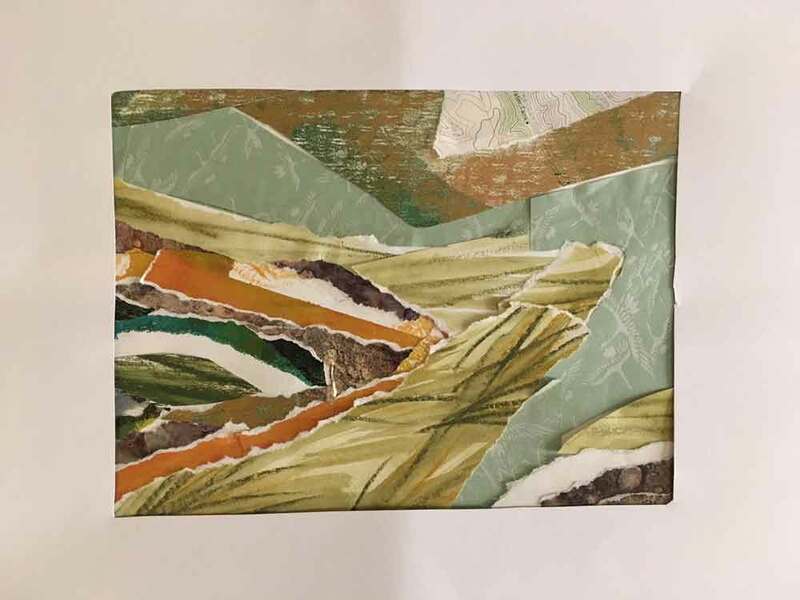 I had always built up my collaged compositions intuitively on a blank sheet of paper, so this was a more challenging method. 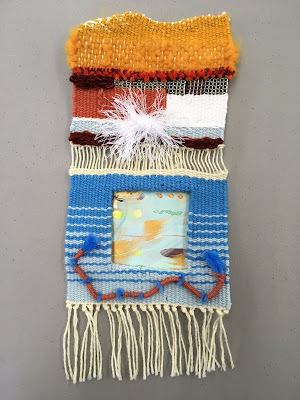 The most eye-opening thing for me about Rowen's workshop was simply being given permission to think outside the box, to let go of traditional notions of pure tapestry: warp faced, using mostly wool wefts, perfectly flat and straight-edged. 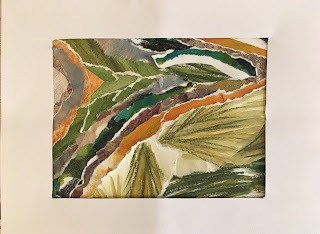 My tapestry teachers up to now have been incredibly gifted practitioners of this traditional approach, and so I have worked within those parameters. 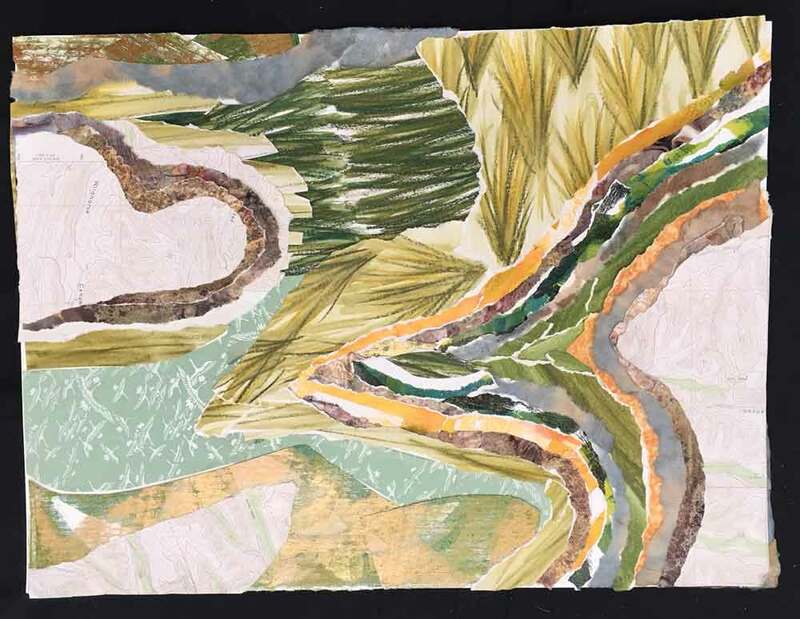 But I love the idea that a tapestry can itself be a collage, with various disparate and surprising elements layered and juxtaposed. 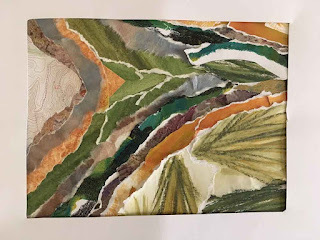 I've been saying to friends that Rowen's workshop "blew the lid off my traditional tapestry box." Tune in next week to find out how my thinking did a 180 when I heard Irvin Trujillo's comments on working inside the box.